As of September, nearly 60% of our state is facing exceptional drought, the most severe designation by the U.S. Drought Monitor. 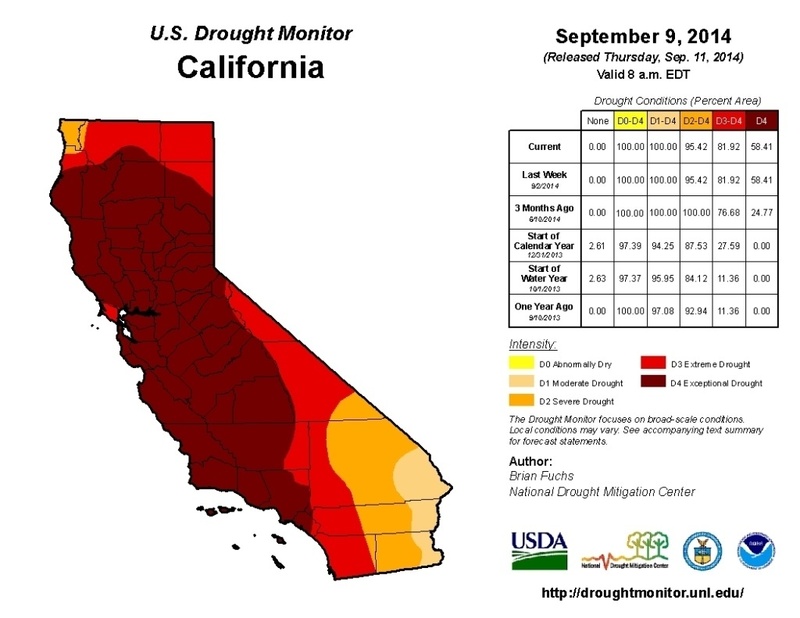 The chart below shows just how dry the soil is compared to the historical average: nearly 90 percent of the state is suffering from either severe or extreme drought conditions. What are the implications of this? For one, farmers have already begun to suffer severe economic repercussions and are likely to face increased unemployment. Estimations predict that half a million acres of farmland will become unusable this year, and food prices will continue to rise across the nation. Wildlife has already felt the effects of the drought: 20-40 percent of fall Chinook salmon eggs laid were destroyed due to low water flows in the Sacramento River. With no end to the drought in sight, water agencies have begun setting mandatory and voluntary restrictions on water use. Some rural communities have already lost access to drinking water as their wells have dried up and some communities are now dependent on bottled water rations.In January, Governor Jerry Brown declared a drought emergency and urged California residents to cut water usage by 20 percent. For a message from the Chancellor and to learn about what UCLA is doing to reduce water consumption, and our Water Action Plan visit this page. Turn off when lathering up: Turn off the faucet when lathering up with soap instead of letting the water run. Less time = water saved: Take shorter showers. Reducing your shower length by 4 minutes per day would save around 3,650 gallons of water per year (and conserve energy required to heat the water)! Turn off water while brushing: Turning off the faucet while brushing your teeth can save about 3 gallons each day! Only turn the water back on to rinse your brush and your mouth. Tray-free dining: For every tray that goes unused, we save 1/3-1/2 gallon water! Find a buddy: If you can’t fill the laundry machine, ask a friend to put his or her clothes in too. Split the cost and you’ll save money too! Reuse towels: Don’t wash towels after only one use: they’re still clean. Report a problem: Please report instances leaks, broken sprinklers, and other excessive water waste by submitting a work order. Limit garbage disposal use: Purchase a sink strainer to trap food and other debris. Turn off the automatic ice maker: Don’t let it run continuously! Consider your water footprint: A pound of lettuce and cabbage have a water footprint of 15-24 gallons, while a pound of beef has a footprint of 2,500-5,000 gallons. Water plants in the morning or evening: There’s less chance of evaporation during this time. Get creative: Set goals by trying to reduce your water bill each month: you’ll find that you’ll discover new ways to conserve! Install low-flow devices: Low flow shower heads and faucet aerators are often distributed for free at community events and through your water agencies. Wash full loads: Only run the dishwasher or washing machine when you have full loads. This will cut back on excessive water, soap, and energy. Check for leaks: Check your irrigation and plumbing throughout the house for leaks. A leaking toilet, for example, could waste as much as 60 gallons of water per day. Use a broom: Avoid using the hose to clean sidewalks, driveways, and patios. Install a spray nozzle: When out washing the car install a spray nozzle to keep water from constantly running. Install drip irrigation: Drip irrigation is more efficient than sprinklers because it helps soaks the roots. Run sprinklers at night/early morning: Set the sprinklers to come on in the early morning during the winter and late at night in the summer to reduce evaporation from the sun or wind. Pull out turf grass: Many water districts offer rebates to remove turf grass. Replace it with drought-tolerant landscaping for extra savings! For more tips on saving water at home, visit the EPA’s Conserving Water resources. Lake San Antonio, CA. 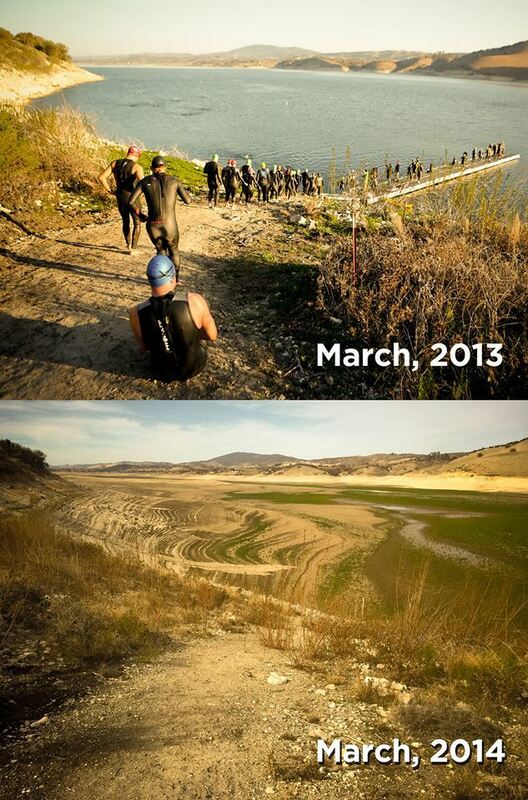 These side-by-side photos taken from the same exact spot show the severe impacts of the drought in Monterey County within the last year. Top Photo Lake Oroville. Licensed through Creative Commons.